The human psyche has long bestowed dark magical abilities upon cobras. The snakes writhe and dance to the charmer’s pipe in captivity; in the wild they fixate on prey with unblinking eyes, appearing as if they themselves are charmers. Witnesses say cobras appear to have hypnotized their prey into submission, but scientists say that’s not what’s happening. Behaviors of cobras and their prey have likely caused the many myths that surround the snake. The king cobra (Ophiophagus hannah) is perhaps the best known of the 20-plus types of cobras. It can raise a third of its sometimes 18-foot-long body off the ground, making it look as if it is standing as tall as an adult human. As cobras hunt, humans have observed other animals wait, unmoving, as the snake approaches to devour them. Adult birds may flutter in front of snakes rather than flying away to safety. Snakes will also sometimes weave their heads back and forth, eyes unblinking, as they approach their seemingly frozen prey. Science provides a few theories for why some animals don’t flee when confronted by the cobra as predator. They may be frozen in fear. They may not realize the danger they face, staring out of curiosity, according to the University of Maryland Cooperative Extension Service website. In the case of an adult bird apparently sacrificing herself, according to Herps of North Carolina, it is likely a mother trying to distract the snake from her nest of babies. Much in the physiology of cobras and other snakes contributes to the myth that the serpent hypnotizes its prey. For instance, snakes have no eyelids, so of course they approach their live meals without blinking. Because of their limited vision, they will sometimes weave their heads from side to side, in what may appear to be a hypnotizing fashion. This is really just a way for snakes to gauge distance. So the cobra doesn’t hypnotize its prey, but the charmer's pipe does hypnotize the charmer’s pipe, right? Wrong, according to scientists and animal rights activists. Cobras can’t hear, so it can't be sounds from the pipe making the snake dance. 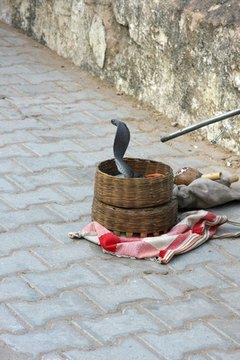 According to Wildlife SOS of India, the cobra comes out of the baskets and sees an object -- the pipe -- waving menacingly above it. This threat is what gets the animal’s response. Many snakes used by charmers have had their fangs removed or their mouths sewn shut to protect the charmer from getting bit by the agitated snake. A snake without means of biting may seem entranced when he's really just holding his ground. What Are the Predators of the Spitting Cobras?